Heating The heating element is wound around the stainless steel pressure braiding; the heating element is then covered with a glass fibre-insulating layer. A nickel-plated copper braiding is wound over the insulation; this also acts as a safety earth. Thermocouple The thermocouple sensor is placed in contact with the stainless steel pressure braiding below the heating element. The standard temperature sensor fitted is Fe-CuNi, "J" type. Other types of sensor can be fitted on request, e.g. NiCr-Ni or PT100. Insulation Several layers of glass fibre insulation cover the heating element and thermocouple. This in turn is covered with a silicone foam layer, which offers a high degree of thermal insulation and a 'warm to touch' property, reducing hand and arm skin burns. External layer An external polyamide braiding protection helps to protect the insulation from scuffs and abrasions. For additional protection a stainless steel braiding is available. Connections The standard heating hose are supplied with a single cable 1.5M long and a 7-pin DIN plug. The plug comprises of single phase to pin 1 or 2, a neutral supply to pins 3 or 4. Pins 5 and 6 are thermocouple pins. Centre pin7, is the earth pin. A panel-mounted socket can be supplied to enable simple connection to the spare tool zone temperature controller. 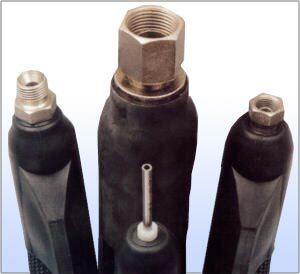 End fittings are available in Metric and BSP threads.